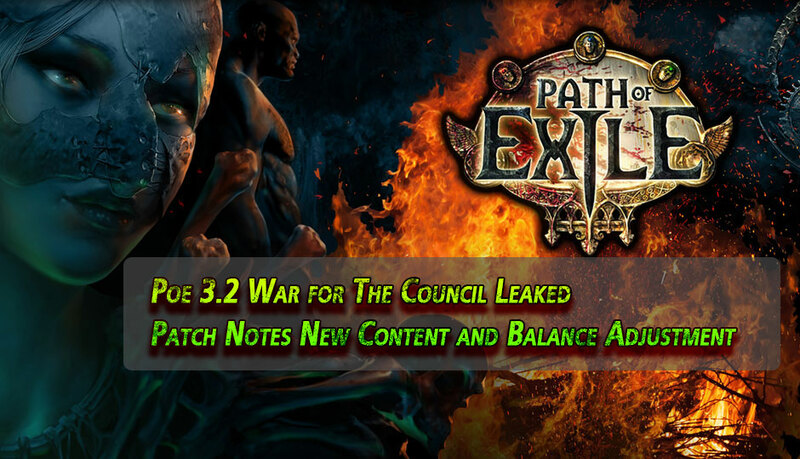 Hi PoeCurrencyBuy Customer, these days we discover news from Poe website forum for the path of exile 3.2, this Path notes named "War for the Council," in this post, we'll share the Poe 3.2 Key New Content material and Capabilities and a few Balance adjustment for you. This news will not publish by GGG, So we cannot be sure it is definitely! Added a brand new expansion: War for the Council. Defend Wraeclast from these evil masterminds! Added a brand new tier of Life and Mana flasks: Holy. Requires level 70. Holy Life flasks restore 2600 Life more than 3 seconds, hold 60 charges (15 charges per use) and restore an added 8% of maximum Life more than the duration. Holy Mana flasks restore 1400 Mana more than 8 seconds, hold 50 charges (12 charges per use) and restore an added 8% of maximum Mana over the duration. Added a brand new flask kind: Energy flasks. They are the same tiers as Life flasks but as an alternative, restore the same quantity as Energy Shield. Life Regeneration is halted in the course of any active effect of Energy flask. Map bosses of red tier maps (tier 11 to 15) now possess a base 20% likelihood to drop a map from the same tier plus a base 10% opportunity to drop a map of 1 tier higher when killed. Players can now change their Ascendancy class when no Ascendancy points are allocated. Far more multipliers on Assistance gems have been replaced with elevated modifiers instead. We have slightly adjusted these values to compensate. We made this choice to battle the concerns of "power creep" as expressed by the neighborhood. Trap Help now features a 15% less harm penalty. No longer supplies extra harm. Remote Mine Help now has a 25% less harm penalty. No longer delivers additional damage. Discharge now features a base cooldown of 0.5 seconds but no longer bargains much less damage when triggered. Ice Spear reworked to 100% Crucial Strike Possibility at maximum travel distance. Base damage lowered by 20% at all levels and Harm Effectiveness decreased to 70% (down from 80%). Ancestral Warchief now features a 25% much less damage penalty. Ancestral Protector now features a 20% much less harm penalty. Summon Raging Spirits base damage lowered by 20% at all levels. Barrage base harm decreased to 35-45% (down from 50-61.4%). Now gains an added projectile at gem level ten, 15, and 20. Can no longer be supported by Greater and Lesser Multiple Projectiles Help. Kinetic Blast explosion count reduced from four to two. Sunder range lowered by 40%. Shockwaves now deal 40% much less harm (down from 60%). This can be a buff. Blade Flurry extra damage per stage lowered to 10% (down from 20%). Now has 20% much less Region of Impact at all levels. Base damage lowered to 30-45% (down from 45-56.4%). Glacial Hammer now converts 100% of Physical damage to Cold harm (up from 50%). Removed improved Chill Effect. Dominating Blow Minion damage rescaled from 35% significantly less damage to 25% less harm. Dominated Minions now possess a 20% likelihood to convert any monster they kill. This is a buff (we adore you, Sexcalibure). Molten Strike can no longer be supported by Multistrike Assistance. Molten Strike projectiles now convert 100% of Physical harm to Fire harm (up from 60%). Molten Strike projectiles now deal 50% significantly less harm (up from 40%). Enfeeble no longer applies a damage penalty to enemies. Flammability no longer reduces Fire resistance. The opportunity to be ignited rescaled from 10-14% to 25-40%. Frostbite no longer reduces Cold resistance. The chance to become frozen rescaled from 10-14% to 15-20%. Cursed enemies now possess a 10-15% possibility to become chilled when hit. Projectile Weakness increased projectile damage taken rescaled from 25-44% to 20-35%. Dark Pact can no longer be cast on oneself. Skeleton sacrifice damage rescaled from 6% of maximum Life to 8% of maximum Life. 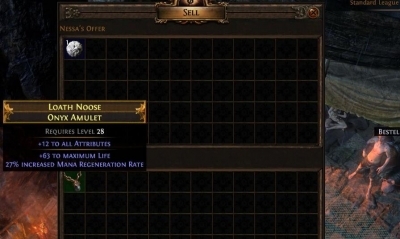 Renamed Vaal Pact to Spirit Vessel. Now grants 100% enhanced Life Leeched per second. Maximum Leech Price is doubled. You can't regenerate Life. Life Leech applies to Mana although on Full Life. 1% has increased all Life node values inside the Ranger and Shadow location. Heart of Oak now grants 2% Life Regeneration (up from 1%). Blood Siphon now grants 1.6% Life Regeneration. Revenge on the Hunted now grants 0.4% Life Regeneration. Chaos Inoculation no longer grants 100% Chaos resistance. Now prevents Chaos harm from bypassing Power Shield and no longer reduces maximum Life to 1. Headhunter is now restricted to a maximum of 2 buffs active. Killing an uncommon enemy will override the oldest buff. Buff duration increased to 25 seconds. Removed Vessel of Viktor. Players have been compensated with an Exalted Orb in exchange for every flask. Atziri's Promise rescaled from 15-20% of Physical damage added as Chaos damage to 10-15%. Basalt flask charges per use rescaled from 40/60 to 30/60. The Scourge bonus Minion harm decreased from 70% to 50%. Monster base harm lowered by 35% across the board. Monster base Crucial Strike Multiplier lowered to 110% (down from 130%). Map bosses no longer have 60% far more Curse Reduction but rather now use an Entropy program. The more significant your Curse Effectiveness, the far more resistant they grow to be to the Curses' effects. Map bosses now grant a further 15% expertise when killed. 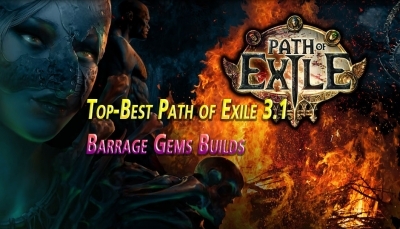 The Ranger is Path of Exile's pure dexterity class, which befits her slim and graceful appearance. If you are looking for PoE 3.2 Ranger Builds, Right here, On then you're in the proper location. Within this Post, PoeCurrencyBuy Will share you Lastest Ranger Builds. 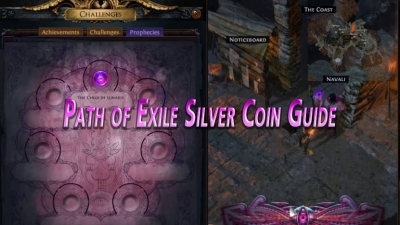 Path of Exile Orb of Scouring is a Poe currency item that can be utilized to get rid of all random modifiers from magic or unique piece of gear. Implicit modifiers, high quality, sockets, and hyperlinks not removed, as well as affixes protected by meta-crafting mods. Poe Volatile Dead is Corpses near the targeted place explode, dealing harm within a modest location and making an orb which moves towards nearby enemies just before selling spell harm within a larger area. 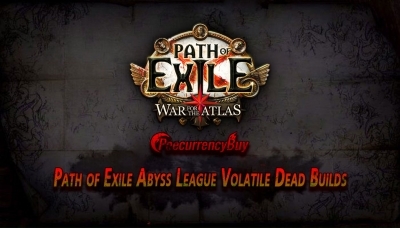 Within this Post, PoeCurrencyBuy will Share Top ideal Path of Exile Abyss League Volatile Dead Builds for you.